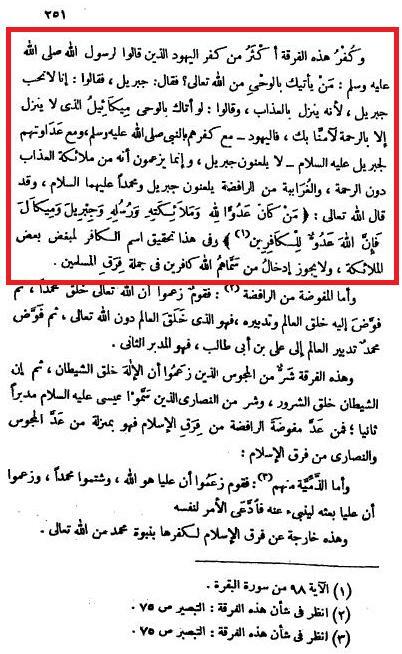 I have always heard this propaganda that Shee`ahs claim that Jibraa’eel (عليه السلام) made a mistake in sending the revelation to Prophet Muhammad (صلى الله عليه وآله وسلم), but instead he was suppose to send it to Imaam `Alee (عليه السلام). Of course we know that this is purely a lie, but after looking through some books of history, it seems that there was a sect that believed in such blasphemy. “Al-Ghuraabiyyah: They claim that Allaah (عَزَّ وَ جَلَّ) sent Jibra’eel (عليه السلام) to `Alee (عليه السلام), (but) he (Jibra’eel) made a mistake and went to Muhammad (صلى الله عليه وآله وسلم), because they looked alike. They said: He resembled him like a crow (ghuraab) with (another) crow, and a fly with (another) fly. 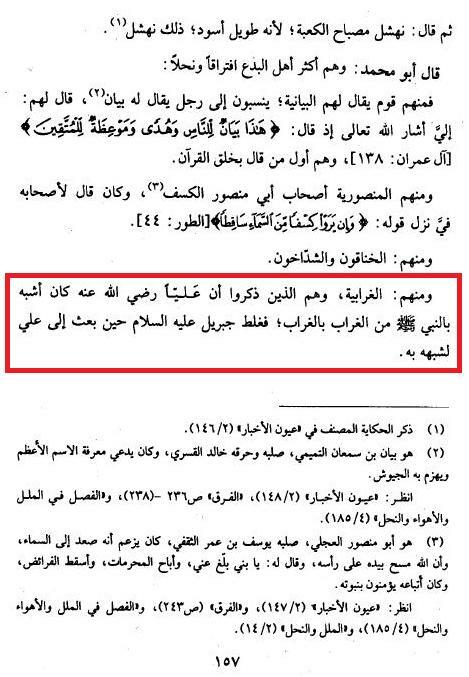 They claim that `Alee (عليه السلام) was a Rasool (Messenger) and his children after him are Rasools (Messengers). This sect (firqah) greets (one another) by saying: ‘May Allaah curse the feathered one’, meaning Jibra’eel (عليه السلام). “And from them, Al-Ghuraabiyyah, they are those who say that `Alee (رضي الله عنه) from him was that he resembled the prophet (like) the crow with (another ) crow, and Jibraa’eel (عليه السلام) made a mistake at the time of ba`ath to `Alee but he (Muhammad) resembled him (`Alee). Here is a Shee`ah Scholar, Al-Buroojirdee, talking about this sect, and their belief. One thing that stood out to me whenever I was reading about this group was how idiotic its followers were. 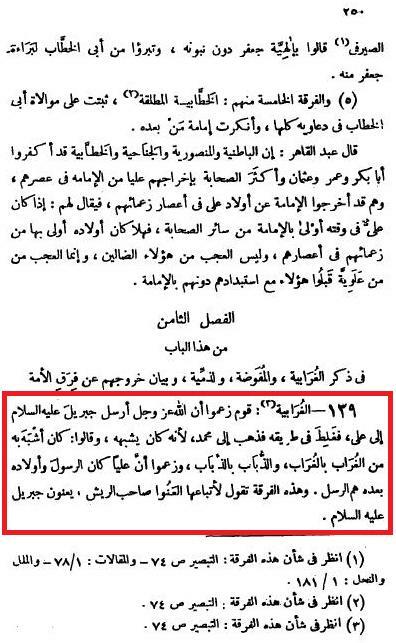 They said that `Alee (عليه السلام) resembled the Prophet (صلى الله عليه وآله وسلم). At the time of Revelation (ba`ath), Imaam `Alee (عليه السلام) was 10 years old, and the Prophet (صلى الله عليه وآله وسلم) was 40 years old, this is an established fact. How and when did a 40 year old EVER resemble a 10 year old? This is sheer stupidity, this sect has never been accepted among the Shee`ah sects, and certainly not amongst the Imaamiyyah (12’er Shee`ahs). This sect is pure kufr, and they are out of the fold of Islaam. If such a person holds this view, they are considered a kaafir, and they are out of the folds of Islaam. yes they are kaffir and i ask allah to guide them and if not then may he take care of them and separate us from them and their likes. may allah also heal the modern shia from this alien concept of wilayat takweenyyat for masoomin which is a highway to shirk and destruction. No member of the school of Ahlul Bayt ever believed in this lie, please read the article where it specifically says it was a sect named Al-Ghuraabiyyah. 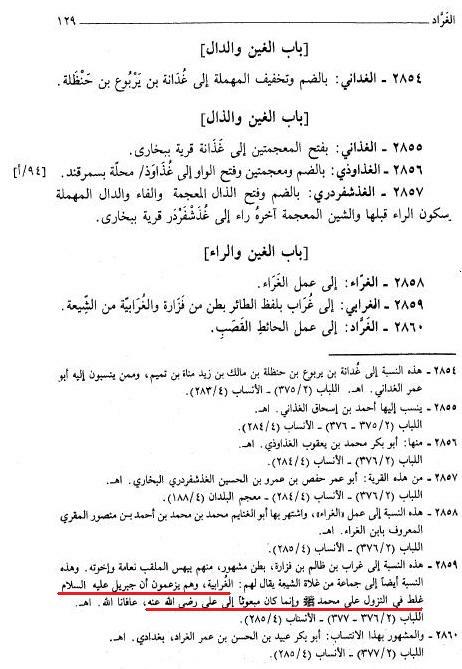 Sunni scholars are well known for twisting text. Al-Ghuraabiyyah is one of the Shia sects for those who are clueless. Repent Before Your Seven Hours Are Up! Hadeeth: "Allaah created Adam in his image"